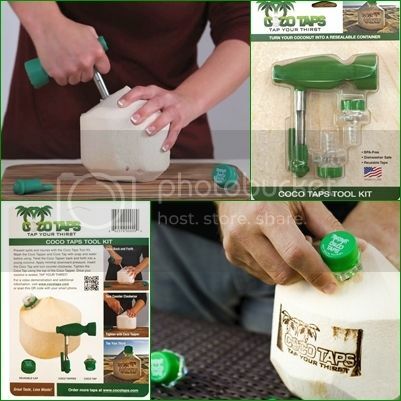 What I love: CocoTaps Coconut Tapper Kit is the easy way to open a young coconut and drink the water. Elijah really likes coconut, coconut milk, coconut juice, coconut soda, coconut meat, and anything coconut flavored, so trying this CocoTaps so he can have his own fresh Coconut milk was a no brainer. Cocotaps is super easy to use and helps to prevent spills and injuries allowing you to turn any young coconut into a pour-able container like any bottled beverage. The kit is 100% made in the USA. It comes with one stainless steel high quality hand drill ad two reusable taps to reseal your coconut water! It feels super durable and I don't think it will have any problems holding up. Using it is easy as 3 steps! Pick out a nice young coconut. To tell that it's correct ripeness, unlike older coconuts you should shake the coconut and hear no sloshing, that means the coconut is nice and full. Step 1: Use the Coconut Drill to create a small hole in your young coconut by twisting and applying a small amount of pressure on the coconut. Step 2: Insert the small Coco Tap into the hole and turn counter clockwise. Tighten the Tap in the coconut with the top of the drill so it's securely fastened in the coconut. Step 3: Your coconut is now sealed. Pour like any beverage! When you're done just screw on the cap and put it in the fridge to keep the water fresh! This is so easy to use and I highly recommend it!